The sentence in the biblical text above was spoken by Prophet Samuel to King Saul. Though Samuel told Saul that God wanted him to utterly destroy all that the Amalekites had, but Saul spared the fat rams and fat oxen. It was God Himself that instituted the ordinance of sacrifice from the Garden of Eden as a way of worship to Him, and for atonement of sin; which He later issued as a command to Moses. So can God resist the sweet odours coming from fat sacrifices? Was Samuel right? Colossians 3: 20 (KJV) – Children, obey [your] parents in all things: for this is well pleasing unto the Lord. Hebrew 13: 17 (NLT) – Obey your spiritual leaders, and do what they say. Their work is to watch over your souls, and they are accountable to God. I Peter 5:5 (KJV) – Likewise, ye younger, submit yourselves unto the elder. Yea, all of you be subject one to another, and be clothed with humility: for God resisteth the proud, and giveth grace to the humble. Romans 13: 1 (GWT) – Every person should obey the government in power. No government would exist if it hadn’t been established by God. The governments which exist have been put in place by God. Ephes. 5: 22 (GWT) – Wives, place yourselves under your husbands’ authority as you have placed yourselves under the Lord’s authority. Why should I obey them? Exodus 20:12 (KJV) – Honour thy father and thy mother: that thy days may be long upon the land which the LORD thy God giveth thee. Spiritual Leaders – For prosperity and success (Example Widow in 2 Kgs 4:1-7). I Kgs. 12: 14 (KJV) – And spoke to them after the counsel of the young men, saying, My father made your yoke heavy, and I will add to your yoke: my father also chastised you with whips, but I will chastise you with scorpions. Old Testament – Meal offering; Peace offering; Burnt offering ; Sin offering ; Trespass offering ; Tithes ; Duties. New Testament – First fruit offering; Thanksgiving offering; Vows ; Love offering ; Praise & Worship; Tithes; Duties. 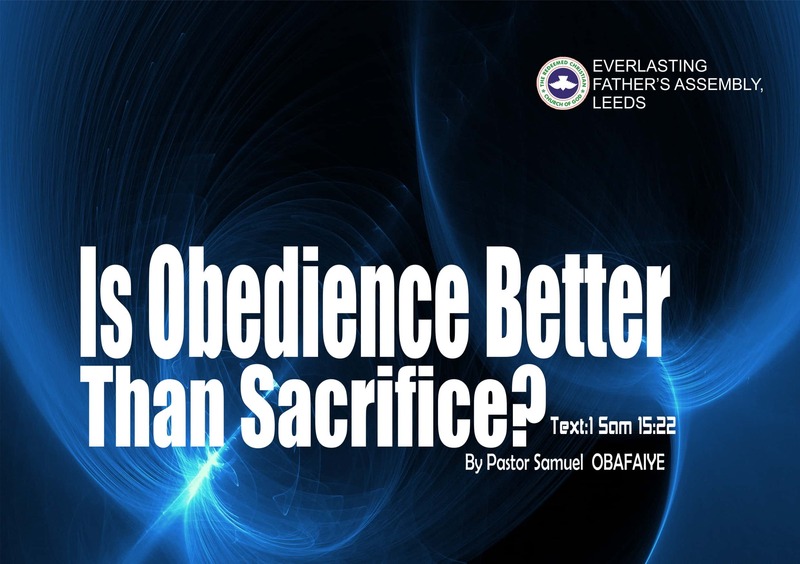 Why is obedience better than sacrifice? While sacrifice seeks to appease God and make one acceptable; obedience already achieves these purposes (Mt. 21: 28-32) – parable of two sons. While sacrifices are meant to re-enact the intermittent breaks in relationship with God; obedience guarantees a continuous intimacy with Him. Why do men prefer sacrifice than obedience? A broken and a contrite heart (Genuine repentance). Body presented as a living sacrifice (Life of holiness). Rom 12: 1 – I beseech you therefore, brethren, by the mercies of God, that you present your bodies a living sacrifice, holy, acceptable to God, which is your reasonable service.